Sale offers a timeless version of the Man of Steel. Beginning in Smallville as Clark graduates from high school, “Superman For All Seasons” is set across the four seasons, covering Superman’s early years as he becomes the protector of Metropolis and strikes up an adversarial relationship with the city’s chosen son, Lex Luthor. 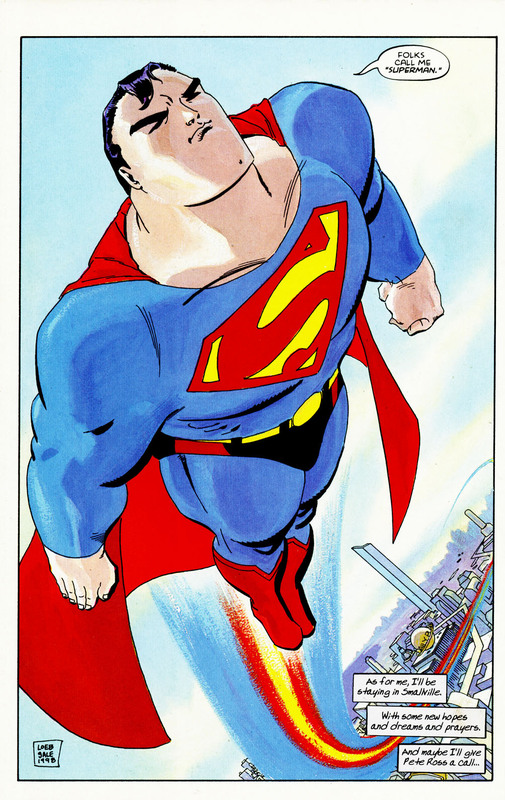 Due in large part to the art team of illustrator Tim Sale and colorist Bjarne Hansen, with a few exceptions the book has an air of timelessness to it, even when the setting changes to Superman’s home away from home (away from home, if you count Krypton). The first of the book’s four chapters begins with Spring and is narrated by Jonathan Kent. Each chapter is told from the point of view of Superman’s key supporting cast: Pa Kent, Lex Luthor, Lois Lane and Lana Lang. It’s the poignancy of the Pa Kent and Lana chapters that are the most resonant as they seek to examine Clark more closely than the two middle parts. In fact, the book has a hard time recapturing the strength of the opening chapter because Jeph Loeb, who has a gift for finding his characters’ voices, has developed profound and perceptive narration for Clark’s adopted father that is unmatched in the chapters that follow. “Sometimes when the corn was planted, it shot up too soon,” observes Pa Kent. “The roots hadn’t taken hold, so the stock couldn’t support its own weight. The corn would turn sour. I don’t know if Clark knew how lucky he was growing up in a place like Smallville.” Who but a farmer is going to compare the fragility of a stalk of corn to the budding moral compass of his adopted boy? Make no mistake, Loeb has done a terrific job capturing each of Superman’s iconic supporting cast, but the folksy metaphors and guiding spirit of Pa Kent are difficult to surpass. Sale tips his hat to Norman Rockwell in his gorgeous interpretation of Smallville. Americana exudes from the page as you move from panel to panel of the stunning opening chapter. From Lana carrying her books over her shoulder using a book strap, to Clark mischievously feeding his dog Shelby from the table, to the men playing cards at the general store, Sale has masterfully captured idyllic small town life. Sale takes great care to fill his panels with details lesser artists might not consider. In the Spring chapter, Sale uses a boot turned on its side and a blanket haphazardly strewn across the porch swing to give the Kent porch a lived-in feel without it looking cluttered or unkempt. Sale’s artwork is made evermore stunning thanks to the often delicate pallete of Hansen. The colorist’s soft natural watercolors are lovely throughout and are often breathtaking. Take your time to fawn over every mindful stroke of Hansen’s steady brush: the slight taupe splashes used to ensure Clark and Jonathan’s overalls are well-worn, the speckled lavender spots that add a homey charm to the Kent dining room, or the charcoal shades on Superman’s broken face which evoke his greatest failure. Above all, and the reason I suspect Hansen was hired to color this book, there are the awe-inspiring two-page panoramic spreads of Kansas. One of the book’s most touching scenes comes in the second chapter as a homesick Clark returns home to Smallville and gives his father a hug in the middle of a cornfield. Hansen uses slight brushstrokes to add subtle depth to Sale’s seemingly endless fields. Sale revisits this sequence over the course of “Superman for All Seasons” as Clark’s voyage becomes more clear. “Superman for All Seasons” is a coming of age story for the Man of Steel, who learns an invaluable lesson about his abilities and of his place in the world. By the second chapter Clark has moved from Smallville to Metropolis, where he quickly ascends to being one of the Daily Planet’s brightest stars. He’s also stupefied the world as Superman, a virtuous demigod in primary colored wrestling gear who has become a one man army against crime. As the most casual Superman fan might guess, this is greeted with the greatest of consternation from Lex Luthor, whose disdain for the hero is unparalleled. When Superman is faced with failure at the hands of Luthor he retreats to Smallville, unsure of himself. Winter is the story’s final season and is narrated by Clark’s first love, Lana Lang. It is this closing story that comes closest to the insightful appeal of the opening chapter and leads to a satisfying conclusion of Clark’s internal voyage. Loeb smartly has kept Lana and Clark’s hearts entwined, leaving the farm boy’s relationship with Lois the faintest of far off glimmers. We see that this story has not only been a journey for Clark, but one for Lana as well. The seventeen year old, who was one of the very few who knew Clark’s secret, learned of it at an age; she had a difficult time coming to terms with the things he could do. On a Fall night a few years before, Lana imagined growing old as the happily married Mrs. Clark Kent. But that wasn’t to be. Only one piece of “Superman For All Seasons” doesn’t work. It’s the brief inclusion of a new heroine named Toxin who comes to Superman’s aid when Metropolis is hit with a deadly airborne virus. For a book that seems totally committed to being a timeless piece, Toxin’s outfit, weapon of choice and moniker are all snatched directly from the decade in which this book was originally published. Toxin, with her thigh-high leather boots and over-sized pistol, is unfortunately out of place even against the modern vistas of Sale’s Metropolis. Sale uses a mechanism to illustrate that Clark is finding order in his life as the story unfolds. In the first chapter we see Clark lying in bed with Shelby. His room is a mess and filled with the customary clutter of any American teenager. 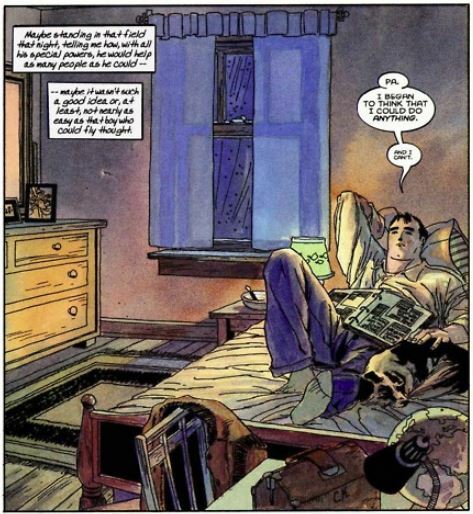 In subsequent chapters, Sale revisits this first panel and Clark and his room become less and less disheveled. Sale’s Superman is a mountain of a man, immovable and ready to take on any threat ‘ol Luthor throws his way. Sale’s immeasurably likable Clark exists without the bravado or need to place his hands on his hips. Clark is a wide-eyed youth who doesn’t have all the answers and wears his vulnerabilities for all to see. It’s hard not to empathize with the young man whose troubled glance communicates that, no matter how powerful his exterior, his heart is not impenetrable. In each of the four chapters that make up “Superman For All Seasons”, Loeb proves himself a master of mimicry, changing his voice markedly so that it is immediately crystal clear which narrator is commanding the story for the next fifty pages. Lex the heartless monster, Lois the perceptive reporter, Lana the woman struggling with a secret, and Jonathan Kent the beacon of wisdom; Loeb takes these iconic characters and attaches sincere motivations to all of them. Through their perceptions of Clark, and of Superman, we get what may be one of the most relatable takes on the Man of Steel, one that doesn’t in the slightest compromise the character. Richard Starkings’ sharp lettering is also put to good use as he finds a thoughtful style for each of the narrators. Superman is still faster than that bullet, he can still leap over that tall building, and a mighty river is just no match for him. But we also meet Clark, the big-hearted farm boy who knows no other way than to be good and we understand who he is. Whether Superman proudly tells a boy who’s complimented him on his costume, “My mom made it for me,” or we’re reading Clark’s homesick-riddled letter to his parents, Loeb clearly establishes that Superman isn’t just some good guy in a cape. He’s a genuinely good guy. That might seem simple, but isn’t that what should exist at the core of all our great heroes?